It's a strange galaxy out there. Today's tale comes from Agent BillMurray. You'll remember Bill from his report earlier this month about bumping miners in Gallente highsec, in his home system of Brapelille (in the Sinq Laison region). Due to the recent acquisition of Elonaya, I have been out lending a hand to the New Order in enforcing the Code. I've already had the usual run ins any Agent can expect; miners sacrificing ships to CONCORD and filled bingo boards being my two main experiences. Still, EVE is an emergent game, and strange new encounters pop their heads up every now and then. One night during a good bumping session, I received a conversation invite from Space Therapist. I entered the chat and greeted them, but didn't receive a response right away. ...I'm a little paranoid. Space Therapist was actually very cordial, and divulged why they wanted to talk. 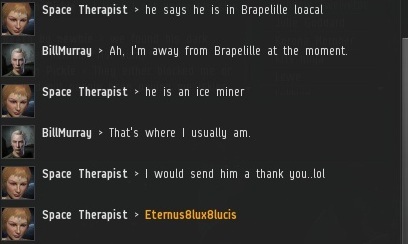 Apparently, someone had hired Space Therapist and her services thinking that I was another miner in the belts. I'm offended at these accusations, but not at the poor therapist duped into talking to me. Hopefully she was paid in advance. A hefty fee, much more than the fee to mine in the New Order's systems. 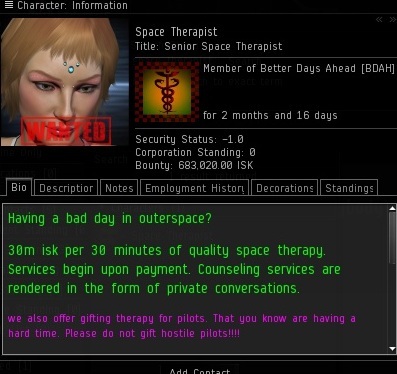 I'd also like to note that before writing this, Space Therapist's bio did not have the clause for not gifting hostile pilots. I can only assume the miner's rage was the reason for this. Speaking of which, who is this miner? I asked, thinking the information would be confidential. The name doesn't ring any immediate bells, but then again, I've bumped so many miners. I apologized to the poor therapist for being duped by a cowardly miner. However, she comes back with more information on the miner. I assume she went and asked what relation the miner had to me. Where is our mystery miner? Brapelille, my home system! It was a miner that had felt the loss of the presence of the New Order asking for my return. Maybe this therapist was a blessing in disguise. While I would love to help the New Order in new areas all the time, I still have a duty to those in far off lands. Consider my bags packed, Brapelille, I'm coming back! After this took place, Bill expressed to me that he was surprised by the encounter, given the fact that he had left Brapelille some time earlier. I told him not to be so surprised--I was still receiving EVEmails from Arvasaras miners several months after I had left. Bumpers may forget some of the people they bump, but miners never forget their bumper.